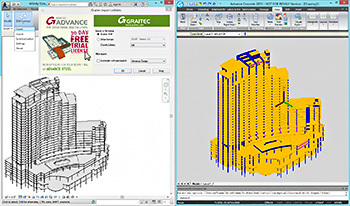 GRAITEC, the fastest growing global structural analysis and detailing software vendor, announces the availability of the new GRAITEC BIM Connect 2014 release as well as its availability in the Autodesk Exchange for Autodesk Revit. 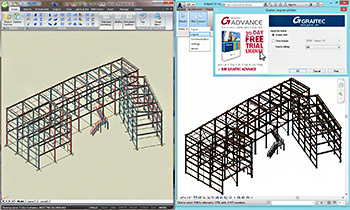 With GRAITEC BIM Connect, Autodesk Revit Architecture and Autodesk Revit Structure users quickly connect their Revit models to the GRAITEC Advance suite and then optimize the design of their structures in accordance with North American and Eurocode standards and produce effective and error-free general arrangement drawings, fabrication drawings, BOMs, NC files for both steel and concrete structures. Essentially based on customer experience feedback, the new GRAITEC BIM Connect 2014 release focuses on details and performance. The new release provides full bidirectional transfer to GRAITEC Advance of any kind of building, regardless of the geometry complexity, starting from the simplest geometries to the most complex ones. 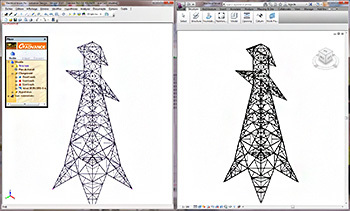 This is achieved even if the structure contains custom profile shapes or random solid bodies, with no shape limitation. From common element sections to curved walls with various openings, curved foundations, any hole shape in structural members, stairs, curved ramps and roofs or sloped slabs, all these are perfectly transferred and allow a smooth data transfer between Revit and GRAITEC Advance, with an immediate effect on the time spent on the projects. More than that, the entire library of the Revit families was mapped to their correspondent profiles in the Advance Steel and Concrete library, leading to an accurate profile exchange. GRAITEC BIM Connect was also reviewed by Autodesk and is now available for free in the Autodesk Exchange for Autodesk Revit for all Revit users. The release is also available on www.graitec.com/revit.